Over some things time has no power. It means they were created perfect. Tandoor is one of these things. 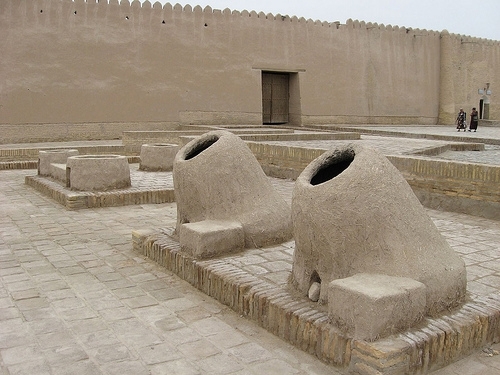 Many centuries ago, a clay oven was invented in the East. With this oven people could cook a great variety of dishes. And all of them — delicious! All genius things are simple. So is tandoor. A ﬁre is lit inside the oven. As wood chips are gradually burning and turning to coals they are generating strong long-lasting cooking heat while the oval shape of tandoor oven provides for superior heat conductivity making sure that food is cooked evenly. With tandoor oven doing all the work all you have to do is thread the meat onto the skewers and place it inside a tandoor. Cooking time varies depending on the size and type of dishes but is always much shorter that the cooking time with a conventional grill or mangal. Tandoor’s design has remained virtually unchanged for the past three thousand years. The recent modern technological modiﬁcations have merely improvedtandoor’s heat conductivity and transformed the oven from stationary into portable. Another wonderful quality of tandoor is how healthy and nutritious it's food is. Tandoor's unique heat conductivity quality ensures that tandoor cooking preserves the most nutrients and vitamins. It also ensures that, unlike frying or grilling, it does not generate any cancer or heart disease causing elements. Everybody wants to stay healthy. 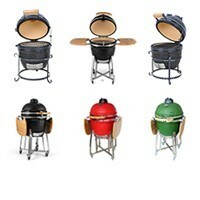 And with tandoor you can! 1. 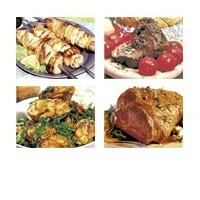 Meat and other products in the Amfora Tandoor obtained much juicier and tastier than on the barbecue, grill etc. 2. 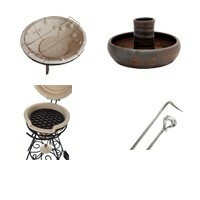 Amfora Tandoor is easy to use. 3. Amfora Tandoor is almost not hard in maintenance and storage. 4. Lifetime is not limited to the Amfora Tandoor. 5. 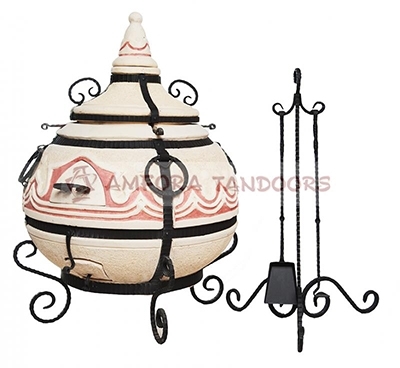 Amfora Tandoor combines several functions - gastronomic, decorative, and communicative it prepares delicious, decorate yard, surprise guests, is the perfect unusual gift. 6. 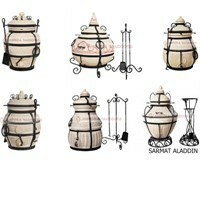 Amfora Tandoor made of natural eco-friendly materials, Hand Made. 7. Amfora Tandoor professionally prepares amazingly delicious meals, while its cost is much lower than the cost of professional equipment. 1.Take off the lid and put dry hardwood inside. The amount of required wood depends on a type of dish (meat kebab, poultry, ﬁsh or vegetables) and a number of desired servings. The height of the wood pile can vary from ‘/2 to 2/3 of tandoor’s height. 2. Open the ash pit and light the wood. Keep the lid open. (If you are using high heat you may see hairline cracks in a tandoor. This is normal. The cracks will not interfere with the wbrk of a tandoor oven). The ﬁrst step is done. You can go back to your party! 3.When the wood is burned down to the gridiron’s level and the soot is gone from the oven walls your tandoor oven is ready for use. The next steps are to evenly distribute the coals, hang the skewers inside the oven walls, and close the lid and the ash pit. You can now rejoin your friends. No need to check on the food or rotate the skewers. Tandoor oven will take care of your food so that you can take care of your guests. 4. The onlything left for you to do is to watch the cooking time. If you are cooking vegetable or mushrooms 3-5 of minutes in a tandoor over will be enough. Fish will take 10-12 minutes. Meat kebabs will be ready in 12-15 minutes. Poultry will take 25 to 30 minutes. 5. If you like your meat with a nice delicious crust just open the oven's lid and ash pjt ﬁve minutes before the meat is fully cooked. 6. Take the food out, put the new skewers in, and let the festivities continue. During the first time increase the inside temperature gradually Do not spill water on the hot tandoor oven Exercise additional caution when using a tandoor oven under windy conditions. The flames can go up as high as 1m. Keep your tandoor oven in a shed or in its slip cover. Tandoor‘s metal surfaces get extremly hot and can cause severe burns if touched without using gloves . Then using tandoor please use proper protection like oven mitts made with natural fibers. Never leave children alone when operating a tandoor oven. 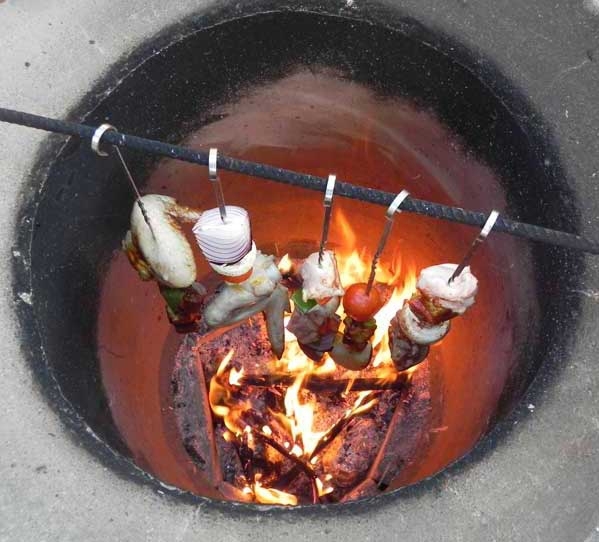 When using a tandoor in an extremly cold weather increase the inside temperature gradually.